Well folks, it took 18 years and lots of petitioning but, The Simpsons have done it! On July 27 Homer and the gang (and I mean ALL the gang) took their antics to the big screen. Before I begin reviewing this movie, let me say something about it. If you have ever talked to my good friend Emily Barber online via AIM then you'll know one of her favorite phrases (at least when talking to me) is "*headdesk*" which she uses (once again frequently in our conversations) to illustrate frustration/lack of intelligence in response to something one (usually me) says. That being said, The Simpsons takes *headdesk* and then puts it to the power of Pi. The Simpsons movie is a testament to stupidity while also being a brilliant satire of our society. Every writer (except two) that has ever written for the television series worked on the script for the film. And I have to say, it shows! The writing on the Simpsons has always been lettuce-crisp, but in The Simpsons Movie, it's straight from the farm fresh! Some lines/scenes have been added to please fans of outright stupid humor (Spider-pig! Spider-pig!) and the rest are bitingly satirical. All of them are hysterically funny no matter what. 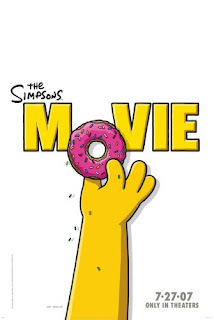 The Simpsons movie is what every fan of the show has been expecting for years and to watch it play out is like a dream we never thought would come true. My favorite line? Todd Flanders: "I wish Homer was my daddy!" Ned Flanders: "AAAAAAAAAAAand I wish you didn't have the devil's curly hair!"